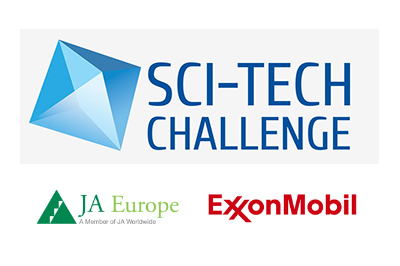 The ninth European final of the Sci-Tech Challenge, organised by JA Europe in cooperation with ExxonMobil, will take place on 17 May 2018 at 12.00 in Brussels. Over the school year 2017-2018, the Sci-Tech Challenge programme is running in four European countries (Belgium, Italy, the Netherlands and Romania) with more than 4,000 students enrolled in the activities. After the online quiz and classroom visits took place at local level, each participating country organised an innovation camp in March, inviting student teams to come up with solutions to prepare a city’s public transport system as environmentally-friendly as possible for the 2020 UEFA European Football Championship. The best solutions from each country were selected by a national jury and invited to Brussels. B3tro team built magnetic rail tracks around the city to create connections between the stadium, the city and possibly the airport. Brainstormers team designed a comprehensive transport system taking into account all types of transport facilities and suggested how to improve them with an economically and environmentally sustainable approach. Willem van Oranje College team developed transport systems for visitors without emitting CO2 and using green transferal from where visitors can take a public bike or electric bus to the stadium, with solar panels providing the necessary energy. On 16 May, those 21 students will meet and participate in a one day- innovation camp in Brussels. They will mix nationalities and form new international teams to come up with solutions to a new transport-related challenge with the support of professional volunteers from ExxonMobil.